Fun Fact #1: Kate Naples ran a race in each of the New England States this past Spring. She will be doing it again in the Fall… starting this past September 16th running in Vermont. A New England Runner, for sure. 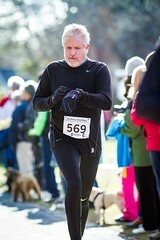 I ran in Brattleboro, VT. A 5K… while somewhat short it was truly Vermont with big rollers, and gusty wind. I finished 3rd woman… took home a loaf of Vermont Bread and a winnings of two homemade jams. Fun Fact #2: Kate will be directing her Fall races… There will be 3 races involved in Kate’s Race Series… adding a 5K in Mashpee the first sunday of December. Fun Fact #3: While in the recent past there has been a car-load car-pooling to the New England Mountain Series each summer, this summer it was just Kate Naples and John Martin maintaining their Mountain Goat status (Kate missed one, John did them all). Probably for the 10th year they have been doing the series, or most of the series. Regular monthly CCAC meetings resumed on September 5th (first Wednesday of the month, 7:00pm, at the Dennis Senior Center on Route 134.) All members are welcome; a few come regularly. Thanks to them. The principal topics of discussion were means of intra-club communication and the Grand Prix races this winter. With respect to the former, there was a general consensus among those present that in future we will rely on electronic means primarily, but will mail postcards on special occasions, such as the Grand Prix, the annual banquet, etc. The printing and mailing of newsletters and membership rosters for an organization of our size runs into several hundred dollars, so many organizations are discontinuing doing so because of the cost. 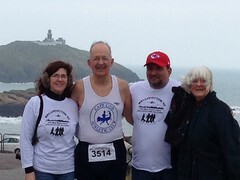 In some cases, e.g., the New England 65 Plus Running Club, members are encouraged to opt for the electronic version to save the club money. On Saturday, 22 September, two autumn running programs get under way. At 8:30 AM, Joe Weinberger and his staff launch the next session of their beginner’s running program. 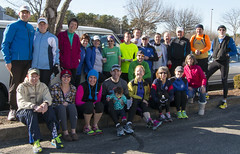 Meeting at Johnny Kelley Recreation Area on Old Bass River Road in South Dennis for 10 weeks, the program culminates at the Andrea Holden 5K Thanksgiving Road Race. 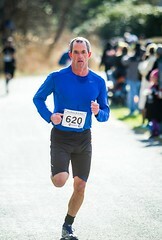 Contact Joe at 508.394.3012 for information or come to the Johnny Kelley park on Saturday morning, ready to run. 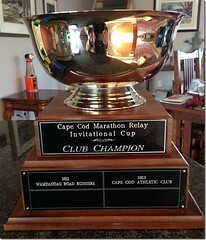 At 1:00 PM on the same day, the Cape Cod Harriers meet at the Barnstable High School track to start the 2012 cross country running program. Designed for students in grades 2-8, the program which is presented in conjunction with the Barnstable Recreation Department will focus on appropriate stretching exercises, conditioning and strength drills, and a whole bunch of running. The season culminates with a cross country race on the playing fields behind the Barnstable Middle School. For more information, contact Barnstable Recreation or fill out the application at the Cape Cod Harriers site. Continuing into the fall, the Hyannis Road Runners will be rolling along with their Wednesday night workouts at the Barnstable High School track. The group meets at 6:00 PM and offers levels for new runners/walkers, beginning runners and intermediate runners seeking the next challenge. Weekly CCAC runs also remain on the calendar throughout the fall and winter as we get ready for the annual Winter Grand Prix. Go fast! As everyone heads back to school today, we’ll be hooking back up at the Dennis Senior Center at 7:00 pm tonight as the monthly club meetings return from their summer hiatus. There are a variety of items on the agenda as we discuss club communications, summer triumphs and injuries, the Cape Cod Marathon team challenge cup, the 2012-2013 Winter Grand Prix and other entertainments and diversions. Pizza and soda and fun at 7:00 pm at the Dennis Senior Center on Route 134.